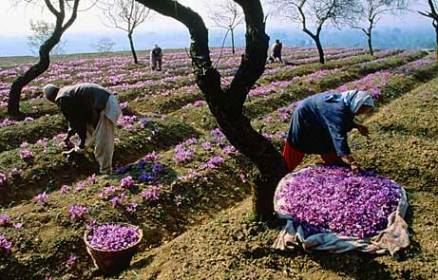 Photo above: picking saffron crocus plants, Kashmir. Bring the water to a boil in a heavy 1 ½ -quart/liter nonstick saucepan. Place the saffron threads in a small bowl and add 2 ½ table spoons (37 ml) of the boiling water. Allow the threads to soak for 10-15 minutes while cooking the rice. Stir the rice into the boiling water and add the cinnamon stick, cloves and salt. When the water resumes boiling, reduce the heat to very low, cover with a tight-fitting lid and gently simmer with out stirring for 20-25 minutes or until the rice is tender and fluffy and all of the water is absorbed. Remove from the heat and let the rice sit, covered, for 5 minutes to allow the fragile grains to firm up. In the meantime, combine the saffron water, sweetener and cardamom seeds in a small saucepan. Place over moderate heat and stir until the sweetener is dissolved. Lower the heat slightly and simmer for about 1 minute. Pour the syrup into the rice and quickly re-cover. Heat the ghee or oil in a small pan over moderately low heat until it is hot but not smoking. Fry the nuts and raisins until the nuts turn golden brown and the raisins swell. Pour the nuts, raisins and ghee or oil into the piping-hot rice and gently fluff with a fork to mix. Spoon onto a serving platter and sprinkle with the sliced pistachio nuts.